Derrick and Khloey Hurtt, the father and daughter heard in a viral video of the West, Texas blast, tell Anderson Cooper that they expected to see an explosion, but were stunned by the magnitude of the blast. Witnesses who saw the fertilizer plant in West, Texas go up in flames and then explode recorded the massive blast and mayhem. Did bombing suspects use timer or remote? In an interview with Anderson Cooper, former FBI Special Agent Jeff Beatty analyzes clues in the Boston Marathon attack related to how the device was detonated and the suspects' behavior. The FBI is asking for the public's help. If you recognize the suspects in the photos release by authorities, call 1-800-CALL-FBI. Anderson Cooper looks at the moments before a fertilizer plant in West, Texas exploded, and the destruction that followed. Anderson Cooper meets a family left homeless following Wednesday night's fertilizer plant explosion in West, Texas. They had lived in the destroyed house, which was 300 yards from the plant, since 1968. "I never heard a blast like that," says Willie "Pee Wee" Zahirniak. He tells Anderson that he and his wife weren't in their home during the incident, and they credit their young grandson for getting them out and saving their lives. CNN's Dr. Sanjay Gupta gets exclusive access to homes and buildings damaged by a fertilizer plant explosion in West, Texas. The wreckage indicates how significant the blast was for the residents and structures near the explosion site. Dr. George Smith and Jill Jenkins describe the frightening aftermath of the plant blast and how they helped the victims in their tight-knit community. 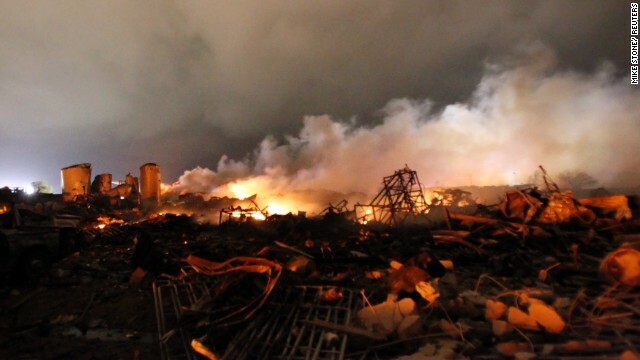 A massive explosion at a fertilizer plant Wednesday night left much of the small town of West, Texas, in ruins. "These are our neighbors, they are coming to help," Waco Police Department Sgt. William Patrick Swanton said Thursday. "You will find that in Texas. You will find that across the United States. We put everything aside when it comes to these types of situations." With more than 160 people injured and others unaccounted for, the need for blood is great and will increase. Currently The Blood Center of Central Texas and Texas Voluntary Organizations Active in Disaster are asking primarily for O positive, O negative and type A blood. The Red Cross of Central Texas has a complete list of area locations currently taking blood donations. Monday was supposed to be a big celebration that no one in Carmen Acabbo’s family wanted to miss. It was her first marathon, and she had spent the past year training for the challenge. Her sister, Celeste Corcoran, a constant supporter, wanted to be there cheering for Carmen with her 18-year-old daughter Sydney and their other friends and family. The mother and daughter were eagerly waiting at the Boston Marathon finish line when Carmen was less than a ½ mile away. Carmen’s husband, Rich, snapped photos of his wife along the route and followed her as she progressed through the course. He was watching for her at the end with their three young children. The four were across the street from Rich's sister-in-law and niece when a flash and loud blast went off. What happened after, changed their lives forever.